After reading my previous article on Delayed Transaction Durability,one of my Twitter follower posted me this question. How do we configure our server to work with Delayed Transaction Durability? Does it comes by default? First thing to note, Delayed Transaction Durability can be applied only at Database level and not at Server level. Here is how you configure Delayed Transaction Durability in a SQL Server 2014. 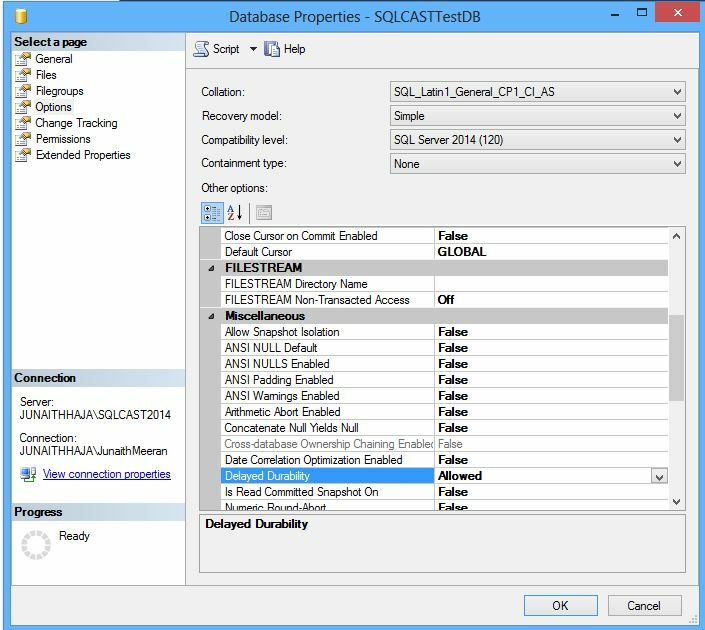 Step 1: Open your SQL Server 2014 in SSMS and Right click the database you want to set this feature and open the Properties window. Step 2: Go to Options and Set the Delayed Durability property as Allowed under Miscellaneous section. Coming to his second question, By default Delayed Transaction Durability comes Disabled with SQL Server 2014 and we can set the property as “Allowed”, “Forced” or “Disabled”. This entry was posted in All Articles, SQL SERVER 2014 and tagged Configure Delayed Transaction Durability, Delayed Transaction Durability, Junaith Haja, SQL Server 2014, Top 5 features of SQL Server 2014 on July 9, 2014 by Junaith Haja.